Towns, a city building and management game mixed with an RPG that draws inspiration from titles spanning Dungeon Keeper, Dwarf Fortress and Majesty. Instead of playing the hero who delves deep into the dungeon, players oversee the town that houses and caters the hero's needs. Along the way, players can craft unique weapons, obtain randomized loot and build a settlement capable of holding back the forces that rise up from the active dungeon upon which the town sits. 3079 is a futuristic, open-world action first-person role playing game, and an alleged lovechild of Minecraft and Fallout, with a block-like world, futuristic action, and role-playing elements played in a first-person perspective. 3079's randomly generated areas, buildings, items, quests and characters make it an entertaining open-world experience. Wyv and Keep: the Temple of the Lost Idol is a lusciously pixelated 2D co-op puzzle platformer. Dubbed as a more fiendish version of Blizzard's classic The Lost Vikings, the game features two young treasure hunters venturing into the land of Amazonia. Take control of the duo and use teamwork to solve mind-bending puzzles, navigate challenging action sequences, and find hidden riches deep within an ancient temple. Play by yourself, with a friend locally on one keyboard, or online, dodging fiendish traps, evading cannibalistic pygmies, shopping for hats, and even exploring an active volcano. Even create and share your own puzzles with the included cartographer. 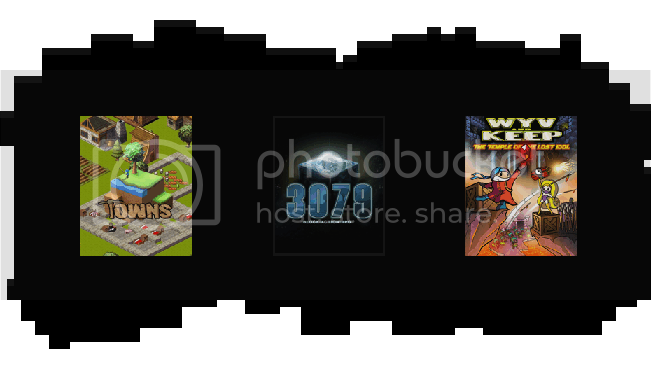 I've only played two of the games from this bundle: Towns and 3079. Both are enjoyable, and have a lot of promise. The developers for both games have a lot of great plans, and the dev for 3079 keeps up with supporters and their suggestions, etc! The bundle will end in about a week! I just want 3079, looks fun! wish it was one steam but I'm gonna download desura just for that game. Considering that they're in alpha, they look pretty good.